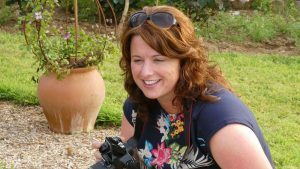 In just 12 months, selfless woman Amanda Evans has inspired over 2000 people to support her mission to help the homeless in Pembrokeshire. December is a time when a large section of the community comes together to celebrate the end of the year and welcome the new, and traditionally when positive goals are set for the future, many relating to living happy and healthy lives. It is also a time when those living in poverty can find life the most challenging. As the majority of society spends time at festive gatherings with work colleagues, family and friends, enjoying delicious food and drink and presenting newly bought gifts to loved ones, the minority continue to exist on an limited budget, with a main goal of having a secure roof over their heads. Homelessness is a complex subject and this word doesn’t always refer to rough sleepers (those living on the street). Homelessness is a situation in which a person does not have a permanent place or home for living. Those who have have knowledge of basic survival skills will know that a human can survive up to three days without water and up to 3 weeks without food, yet shelter is one of the key necessities for humans to survive. “I began a Facebook group towards the end of 2017 as I’d moved from Kent in November 2016, leaving behind family and friends and felt very cut off. Whilst living in Kent and out running one cold evening in February, I saw a man standing in the doorway of a derelict house. Being a woman on my own I crossed the road and kept going. Next morning I heard he had frozen to death. I found out he had been in his 30’s and he died with a few personal possessions around him. He didn’t break in to the property for fear of getting arrested, so remained outside where he died that night. I was so upset to hear this, I didn’t know him at all but I remember thinking what a terrible way to die. So in November 2017 I enquired about someone I saw in Haverfordwest who I thought may have been homeless. This triggered my memory of the gentleman who died in Kent and I realised what I wanted to do. I received a laptop for my birthday and I began my mission. I thought of helping with knitted hats originally, but I can’t knit so I went on Facebook and asked people in Pembrokeshire to help. Hats soon came in thick and fast and I searched for as many concerns as possible that I could send them to, not just in Pembrokeshire but other areas of Wales that have problems with homelessness. After Christmas I wanted to continue. I was meeting more people/friends and enjoyed helping. I realised homelessness is more hidden in Pembrokeshire and being rural, there are plenty of places for people to tuck themselves away. It didn’t take me very long to realise the weather is not great here either. I decided to put together emergency packs for anyone homeless and perhaps has very little to survive on. Each pack is made up of a rucksack, tent, sleeping bag & mat, stove, food items, new underwear, toiletries and much more. This is intended to help for the first 72 hrs and in that time they can be sign posted to other agencies for support. All the items are donated by members of the Facebook group who have all been fantastic. We have donated over 100 boxes of essentials to concerns who work closely with homeless people and we have also supplied 10 emergency packs to people in Pembrokeshire who had very little to survive on. There are also 5 Pay It Forward venues (Munchies, Haverfordwest – The Green Shed Cafe, Merlins Bridge – Checkers Cafe, St Govans Center, Pembroke Dock – Bridge Caff, Kilgetty – Spinnaker Cafe, Milford Waterfront). The public can go into these and either donate the cost of a drink or meal to the cafe participating. We provide vouchers so that person can redeem a drink and meal should they need food. In one year we have grown to over 2,000 members of Facebook. I am amazed by the kindness of the group and how supportive they are. Everything is done voluntarily and it has become a full time job. 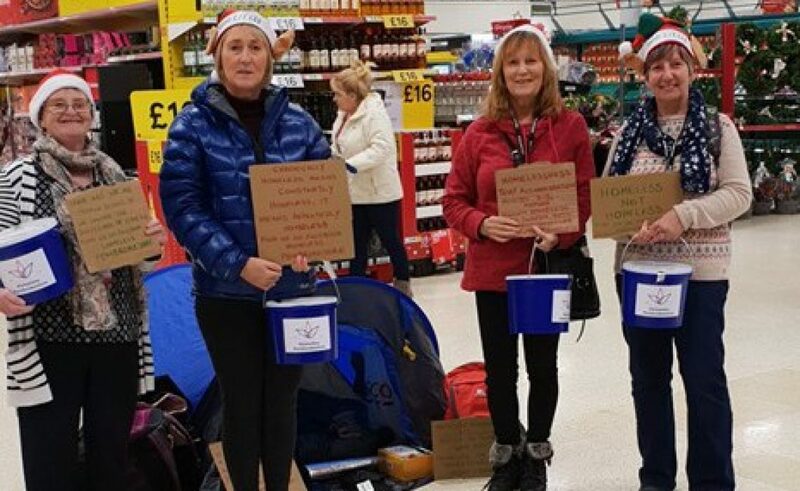 On 3rd and 4th December, Amanda and friends held a fundraiser in Morrisons and Tesco, Haverfordwest, adorned with Christmas hats, homemade cardboard signs and collection buckets. They collected a staggering £1243.90 over the two days. Due to Amanda’s success so far, Homeless Pembrokeshire have been offered a temporary space to work from in The Green Shed (next to FRAME in Merlin’s Bridge) and they are hoping to secure permanent premises in the new year. Help Amanda to make a difference this Christmas! 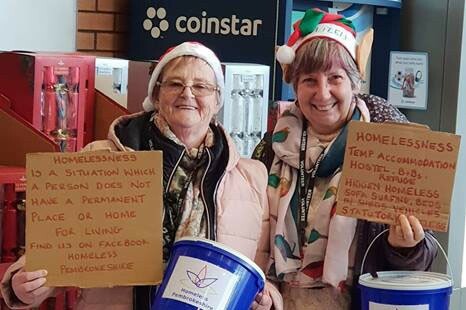 Homeless Pembrokeshire has an Amazon Wishlist on their Facebook Group (in the Announcements section) – this covers the items they include in the emergency packs. If people would rather buy their own items, there are drop off points at The Wool Shop, St Govans Centre, Pembroke Dock – The Ark, 5a Bridge Street, Haverfordwest and Renaissance Jewellery Shop, Tenby. Useful items include; new underwear (men’s & women’s), clean good condition sleeping bags & tents, easy dry packet food items, toiletries. More items can be found here. Full information can be found in the Homeless Pembrokeshire Facebook group in the Files section.